male who has experienced intermittent pain in the right knee for the past three years presents with chief complaint of constant and severe pain “Off and on for the past two months,” An interference with his accustomed lifestyle, the pain is described as “continuous but worse when walking or putting weight on the knee.” The pain lessens but remains uncomfortable upon sitting, he adds. sports injury in the past. He works out by running on a treadmill “to stay in shape,” despite the knee pain. After a review of the patient symptoms and further examination a diagnosis of Osteoarthritis was confirmed. “Will running cause arthritis?” is a question many patients ask. However, according to Dr. Lyle Micheli of Harvard Medical School Dept. of Orthopedics in Boston, the answer is “no.” Dr.
Micheli compared the frequency of degenerative arthritis in 504 former collegiate long distance runners with that of 287 former collegiate swimmers. His study found the frequency of degenerative arthritis 2.0% lower in long-distance runners than in swimmers (2.5 %), even though swimming requires little stress on the body’s weight-bearing joints. As an indication of arthritic severity, Dr. Micheli also recorded the number within each group with an arthritic problem severe enough to require surgery. Comparing the two groups, the need for related surgery was found to be three times greater among the swimmers than among the runners. What is Pitcher's Elbow? 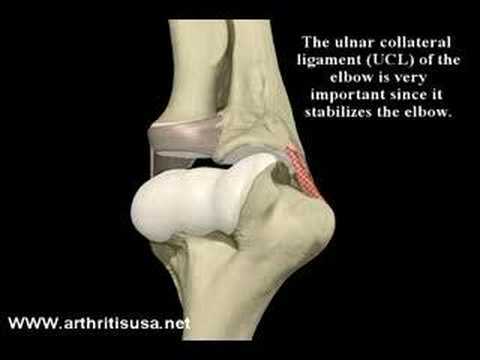 What is Ulnar Collateral Ligament?